Back in October 2010 I started a scarf, knit lengthways in linen stitch, from four skeins of Koigu Painters Palette Premium Merino (KPPPM). 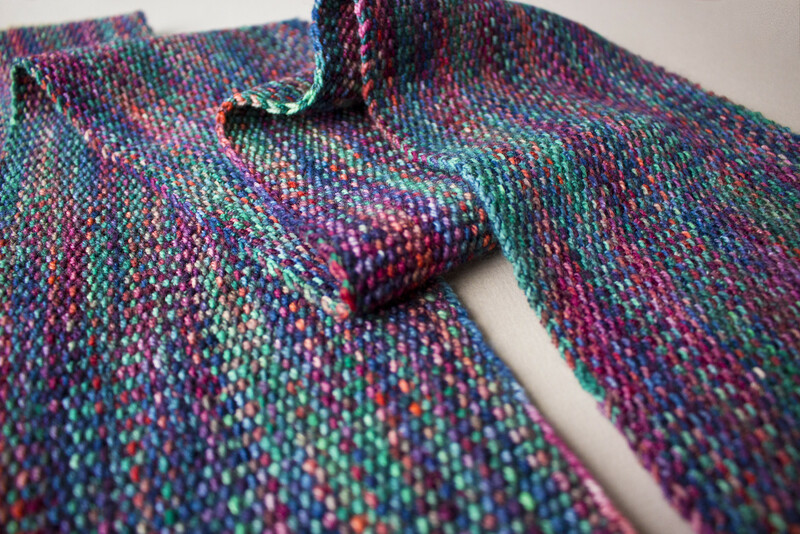 Things in my life were not right at that time, and it was a meditative marathon of a knit. Each row of 550 knit one, slip one stitches took forever, but I needed something for my hands to do whilst my mind worked through some tough times. I picked it up very occasionally and worked through a row or so, but at the time I was not knitting very often. I found it difficult to knit in sadness, and when I moved to a women’s refuge suddenly in 2011 it was only a couple of inches complete, and long forgotten about. As fate would have it, it was the one project that I met back with when I got a few possessions some months later in 2011, and it was duly stuffed into a bag and locked in a trunk. I may have knit a few rows on and off, but my heart was never with it as there had been sadness knit into every stitch. Last December (2017) I was sorting through the long-abandoned project drawer and decided that despite the sadness with which the project seemed to be imbued, the yarn and stitch were really quite amazingly lovely. From that spark of recognition of the beautiful object I had started to create I, somehow, completed thousands upon thousands of stitches of linen stitch in the space of three days. It was done, and it was lovely. Most importantly, though, it was done. My needles were free. I felt like I was reclaiming those two points from a past time, and the knowledge that I had completed that blasted beautiful scarf was enough. It’d be great to wear, sure, but it was finished, and that was more important. It was so much more important than wearing it, in fact, that I immediately shoved it back into a drawer and instantaneously forgot about it. A few times in the last year I have thought ‘I really should block that one day’ in a very half-hearted fashion. Only a week or two ago my husband asked me if I thought I would ever finish that half-knitted scarf, and I had to remind him that I did indeed already finish it a year ago. So, I thought next year I would block that scarf. I started thinking maybe I might even do it in January. Maybe in the first week of January, even. Maybe now, December the 31st, because otherwise it’s becoming more like a New Year’s resolution, which I refuse to set myself. So, today at lunch time, whilst my husband and little boy were braving the supermarket, I blocked that scarf. I steam blocked it, and it took maybe ten minutes… and then it was done. Ten short minutes. To be fair, I’d expected to be taking a longer time to block it as I have only ever wet-blocked things before, but the experimental steam block worked perfectly on this long, straight, smooth piece of knitting. The long cast on and bind off edge sit crisp and perfectly straight. I don’t even remember how I managed the tension at cast on and bind off, but somehow the years and circumstances of this project all came together to make something really quite amazing to me. There are many a pattern for linen stitch scarves, but I used a few techniques in mine that differ from most. 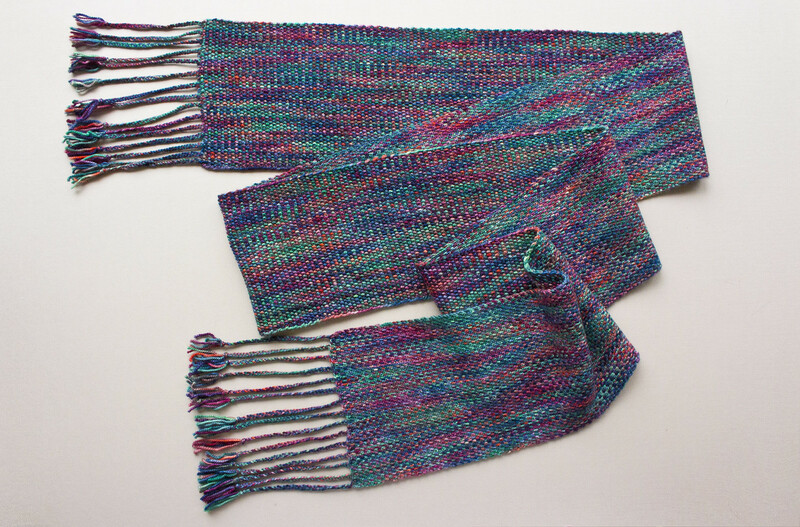 The scarf is knit entirely from knits and slipped stitches. There are no purls, and the scarf is knit flat, but you only ever knit with the right side of the work facing you. I kept notes on this project the whole time I was knitting it, and I love it so much that I have written up the instructions in a pattern free to download for blog readers for a short time. YARN: Koigu Painter’s Palette Premium Merino, 4 skeins (shades can match or be a variety). NEEDLES: 3.75mm & 4.5mm circular needle, at least 120cm long, or size needed to obtain gauge. 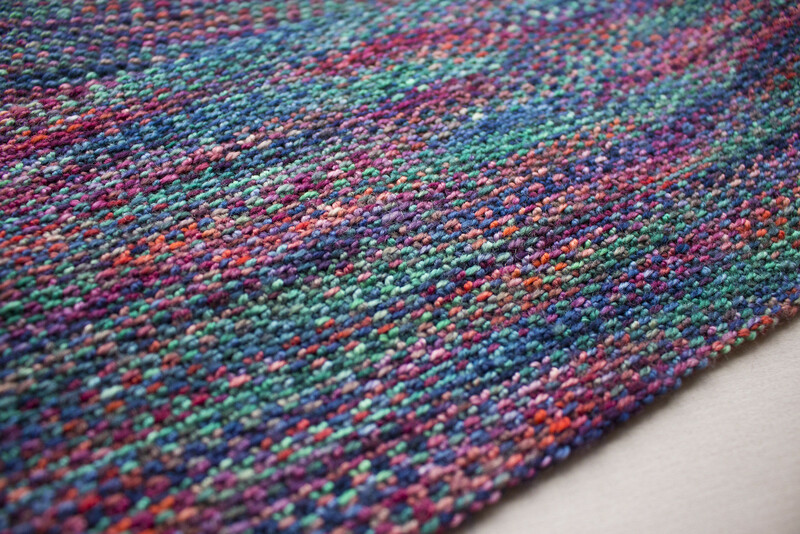 GAUGE: 39 sts/62 rows per 10cm (4”) in linen stitch. Please note: linen stitch compresses stitches to form a smooth, woven-like texture. It is very important to check gauge. 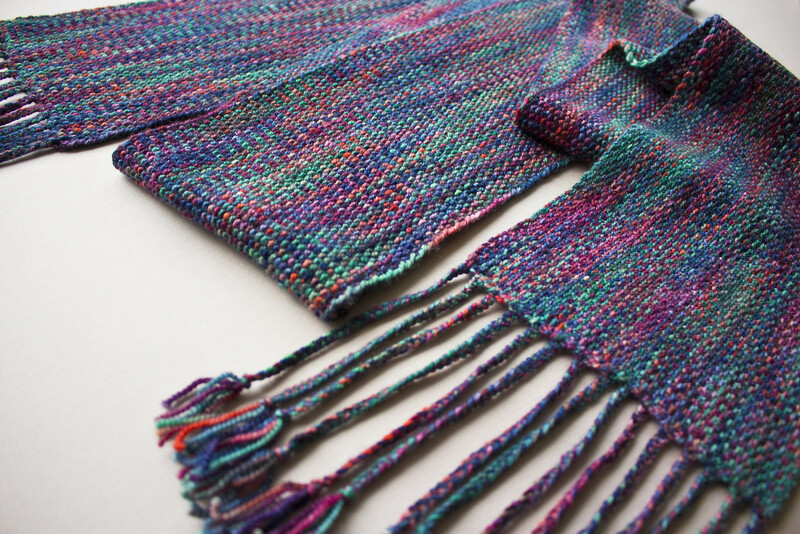 MIMI’S LINEN STITCH SCARF was devised and knit through many experiences and big life changes, and it emerged beautifully at the end of it all. This scarf is knit lengthways. Each row is a meditation. 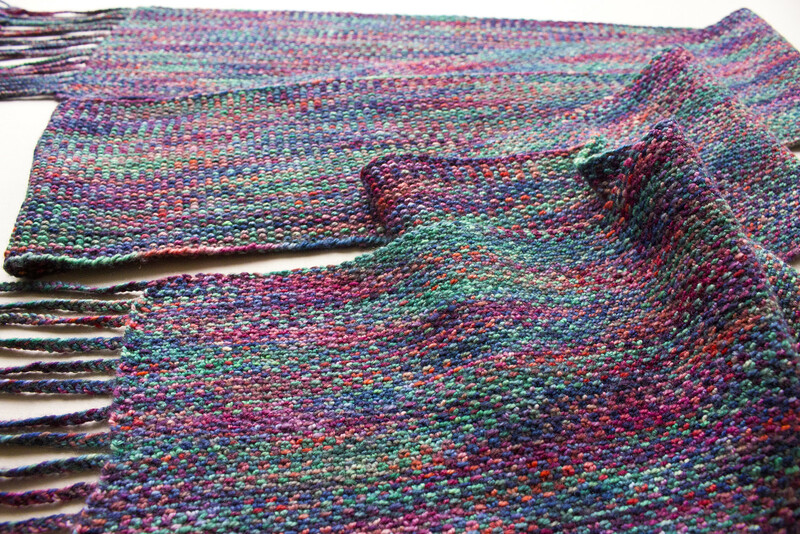 This is a project comprised only of knits and slip stitches. You’ll be facing the right side of the project at all times and though it is comprised of many long rows, the result is a piece of knitting that should be cherished for a lifetime. Wishing you happiness in your own knitting. Thank you, Mimi. I love the finished, finished, finished scarf. Such a beautiful scarf. 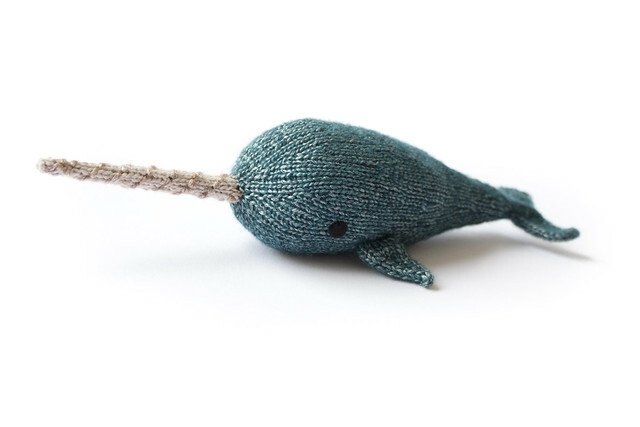 I will knit this using some up cycled yarn as my next project. Thank you for sharing. 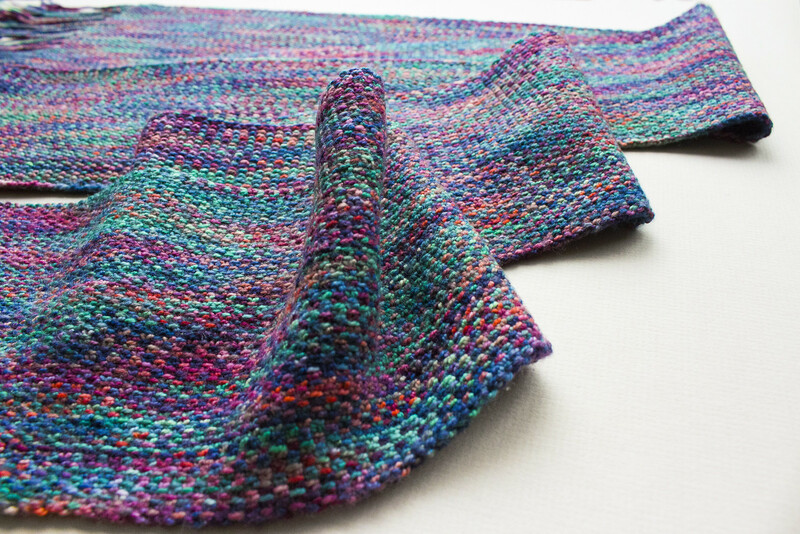 I love this scarf but have a question about the 10 inch strand of yarn that you leave at the beginning and end of each row. Is there any trick to securing the beginning of the row strand? I am sure that the end strand is just pulled through to secure it but I am not sure what to do with the beginning one (if that makes any sense)? Thanks so much! Do you happen to recall the colorway of the Koigu you used? Hello! Unfortunately it is a discontinued (about ten years ago!) colourway, but any of the Koigu shades will work as well. This is definitely a project where you should just go with your favourite colour combination, whether several skeins of one colourway or a mixture of a few!